In addition to EEWC-CFT national conferences every two years, our organization has local chapters that meet on a regular basis. EEWC-CFT members and chapters in neighboring states sometimes join together to present regional events as well. • The 2017 Midwest Christian Feminism Today Retreat was held May 20 and 21, 2017 at the Lindenwood Retreat Center in Donaldson, Indiana. We gathered to enjoy fellowship, worship, and learning based on the scripture: “If you’re discontented, find contentment in the presence of the various images of nature.” Gospel of Mary 8:9-10. On Monday, June 29, 2015, Michigan CFT members hosted a potluck and conversation facilitated by the Rev. Katherine Baker on feminist and womanist theology. Read more here. Lindenwood Retreat Center in Donaldson, Indiana. We came together to enjoy fellowship, worship, and learning. Our theme was based on Psalm 116:7, and we discussed and practiced various forms of centering, healing, and relaxation techniques including: walking, drawing, and mindfulness meditation, breath work, lectio divina, yoga, and labyrinth walking. • The Southern California Chapter sponsored An Epiphany Party in January of 2015. We enjoyed tea and sandwiches and a wishful thinking gift exchange. • The Southern California Chapter sponsored the event, “Presbyterians and Gay Ordination: Recent Changes and Continuing Culture Wars,” a conversation with Sonnie Swenston, Presbyterian Elder and commissioner to the 221st General Assembly PC(USA) in June 2014. • The Indiana Chapter attended the Fringe Festival theater production of “Creation” on Friday, August 22nd. EEWC-CFT member Casey O’Leary and her partner Jenni White were members of the cast. • EEWC-CFT’s Indiana Chapter sponsored the “Risk of Pursuing Your Passion” panel discussion Spirit and Place on Thursday, November 7, 2014, at the First Mennonite Church in Indianapolis. • The 2013 Midwest Regional Retreat was held at the Lindenwood Retreat Center in Donaldson, Indiana on September 28 and 29, 2013. •The Southern California Chapter hosted “The Bible and the Border” event on April 20, 2013. • EEWC-CFT’s Indiana chapter met on March 23 and shared in an afternoon of friends and fellowship. • EEWC-CFT’s Southern California chapter held an Epiphany party on Sunday, January 6, 2013. • The Indiana Chapter met for lunch and then attended a Theatre Non Nobis performance of the collaborate piece, “G-D” at Theatre on the Square. The play was a part of the 2012 Indy Fringe Festival. • The Indiana Chapter’s 2012 Spring Retreat was held at a beautiful facility just west of Indianapolis, The Retreat Campus. Of course there was food, fun and fellowship! The focus topic was an exploration of the feminine Divine. 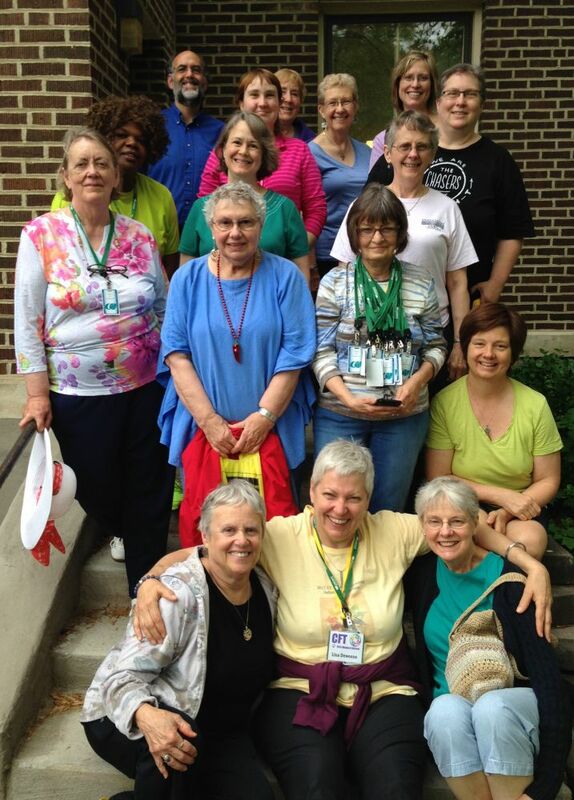 • Several Midwest EEWC-CFT Fall Retreats at the Lindenwood Retreat and Conference Center in Donaldson, Indiana. • The Chicago chapter’s interfaith feminist learning retreat, Enlarging our Horizons, Embracing our Sisters: Conversations among the Daughters of Abraham (March of 2011). In the age of #Metoo and #Timesup, heart connections between women have become ever more vital. We need each other; we are created to crave connection. “In Such a Time as This,” let’s continue our Christian feminist collaboration to create the change we want to see in our world. Meet Me In St. Louis — And That’s What We Did!